After launching Xperia Z1 Compact, a mini version of its flagship Xperia Z1 smartphone at the recently concluded Consumers Electronic Show (CES) 2014, Sony is at it again. 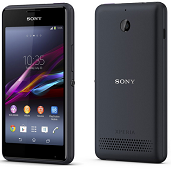 The company has now unveiled not one but two devices, christened Xperia T2 Ultra phablet and Xperia E1. While the first one is a 6-inch phablet, the second one is a mid-range smartphone. Interestingly, the company has also unveiled dual-SIM versions of both Xperia E1 and Xperia T2 Ultra. The phablet features a 6 inch TFT capacitive touchscreen display (1280Ã—720 pixels resolution) and runs on the Android 4.3 (Jelly Bean) operating system. It is powered by a 1.4 GHz Qualcomm MSM8928 quad-core processor and has 1GB RAM. The device offers 8GB of internal memory, which can be further expanded up to 32GB with a microSD card. It has a 13MP autofocus rear camera with LED flash that can record full HD videos (1080p) at 30 frames per second. The camera is built with the very same components as Sony's digital cameras, and features an Exmor RS for mobile image sensor and HDR for both pictures and videos. In addition, there is a 1.1MP front facing camera for video calling that can also record HD videos. On the connectivity front, the device has Bluetooth 4.0, Wi-Fi (with Wi-Fi Direct), 3G, & 4G LTE, and it also has a microUSB port & a microSD card slot. Xperia T2 Ultra measures 165.2mm x 83.8mm x 7.65mm and weighs 172 gm. Sony has added a 3,000 mAh battery in the device, which it claims will provide up to 24 hours of talk time, 10 hours of video playback time and up to 1,071 hours of standby time. The phablet also comes with Near Field Communication (NFC), FM radio with RDS, and GPS (with A-GPS support). It will be available in black, white, and purple colours. A battery 'STAMINA Mode' has also been provided in the device, which recognises when users are not using their display and automatically turns off the functions they don't need, while keeping the notifications they want. As soon as you press the power button to wake up your screen, everything is up and running again. Note that with battery STAMINA Mode, Wi-Fi and data traffic are disabled during standby, but you still receive incoming calls, texts and alarms. However, you can customise which apps you want to receive push notifications from even in standby mode. The smartphone features a 4 inch TFT capacitive touchscreen display (480x800 pixels resolution) and runs on the Android 4.3 (Jelly Bean) operating system. It is powered by a 1.2 GHz Qualcomm MSM8210 dual-core processor and has 512MB of RAM. The internal memory of the device is 4GB that can be further expanded up to 32GB with a microSD card. This one has a 3.15MP rear camera that comes that can record WVGA videos at 30 frames per second, but no front facing camera for video calling. On the connectivity front, the device has Bluetooth 4.0, Wi-Fi, & 3G, and it also has a microUSB port & a microSD card slot. Xperia E1 measures 118mm x 62.4mm x 12mm and weighs 120 gm. Sony has added a 1,750 mAh battery in the device, which it claims will provide over 9 hours of talk time, and up to 551 hours of standby time. The smartphone comes with FM radio with RDS, GPS (with A-GPS support), and will be available in black, white, and purple colours. Primarily a music phone, the device also comes with a 'Walkman' app that lets you play, share your favourite tracks, create playlists and combine your online and offline music in one view. And with 'Shake control', changing your tune is as easy as shaking the phone- just press and hold the Walkman key placed at the top of the smartphone. It also comes with 'Clear Audio' technologies from Sony including Clear Stereo, Clear Bass and Clear Phase â€“ for minimising distortion and restoring balance and clarity to tracks.